Whether you agree with the concept of monarchy or not, you can’t deny Queen Elizabeth is a remarkable woman. If for nothing else than putting up with Old Phil for all these years. But as the head of state, she’s given a few little accessions to get her through hump day. From dismissing the entire Australian government to owning all of the dolphins in the British Isles, Queenie’s got a nice little repertoire of work perks we’d be happy to boast about in the pub. The Queen owns all the swans in the River Thames. Queen Liz even has her own personal Swan Maker and Swan Warden, who conduct an annual swan census called the ‘Swan Upping’. The Queen can fire the entire Australian government. As the official Head of State in Australia – as well as New Zealand, Canada, Barbados, Jamaica and other Commonwealth countries – Liz has certain powers over the government. I’m sure she’d never put this power to the test and dissolve their Parliaments, sending global political systems into meltdown, but it’s nice to have the option all the same. The Sovereign owns all dolphins in British waters. The Queen still technically owns all the whales and dolphins in the UK, in a rule which dates back to a statute from 1324. I, for one, am disappointed she didn’t incorporate Flipper into her birthday celebrations. She’s the head of a religion. The Church of England needs a monarch as its head, with the right to appoint bishops and archbishops. Enter Queenie, whose formal title is ‘defender of the faith and supreme governor of the Church of England’. She may be entering her twilight years, but Queen Elizabeth can throw around a Land Rover like the best of us. Still, she oddly needs neither a driving license nor a registration plate, according to law. The Queen can travel without a passport, too. She’s the only member of the Royal Family who doesn’t need a passport. Maybe she uses a fiver instead. With no form of identification and a killer set of wheels, what’s stopping the Queen from busting out of this dead end job? Over 1400 parading soldiers, 200 horses and 400 musicians come together for #TroopingtheColour in a great display of military precision, horsemanship and fanfare to mark #Queenat90 This year The Queen’s Colour of the Number 7 Company Coldstream Guards is being trooped. Well, the two birthday thing is a perk that I’d stick around for. 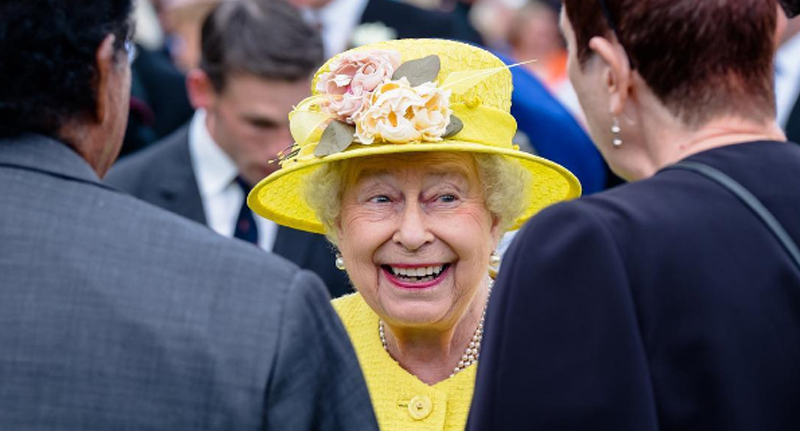 The Queen’s official birthday is celebrated on a Saturday in June, even though her birth date is 21 April. Her official birthday celebrations are petty epic… Trooping of the colour followed by Gary Barlow. She has a private cash machine in her house. The elusive, prestigious and exclusive bank, Coutts installed a private cash machine in Buckingham Palace’s basement for all those little cash-in-hand emergencies. The Queen has her own poet. The poet laureate – an honorary role given to a poet ‘whose work is of national significance’ – is appointed by the monarchy and is given a barrel of Sherry. Carol Ann Duffy – who you might remember, despite yourself, from A Level English Literature – will hold the position until 2019. She can technically veto laws. Although the Queen rarely gets involved with British politics, every law proposed and passed by both of the Houses of Parliament must receive ‘Royal Assent’ before they can be officially enacted. A British Monarch hasn’t refused Royal Assent since Queen Anne in 1708. The Queen has the power to elect Lords to the upper house of British Parliament – but the monarchy only does this on the advice of the government, and even then, it’s a rare occurrence. She doesn’t have to pay tax. Queen Elizabeth has been voluntarily paying income tax and capital gains tax since 1992, despite not being required to do so by law. The Queen can form governments. The Queen can no longer dissolve Parliament and call a General Election – the 2011 Fixed-Term Parliaments Act put a stop to that, instead requiring a two-thirds vote in the commons. But the Queen still has a role to play in General Elections – after the majority party is announced, the Queen formally calls on the most able MP to form government. While Knights don’t ride around on horses, clicking together coconut shells, the British monarch still personally approves and knights figures who have made a positive impact on her country. Knighthoods are suggested by Ministers and passed on to the Queen for approval. Her private documents stay private. After a legal battle between the Royal Family and The Guardian over the so-called Black Spider memos, the Queen is now exempt from Freedom of Information (FOI) requests. The Guardian won the battle but precedent has since been set saying journalists are unable to access the Queen’s private documents, even if they claim a public interest. She gives special money to the elderly. Maunday Money is legal tender that the Queen hands out to a number of pensioners in a formal ceremony held in a cathedral, each Easter, annually. Since her coronation in 1953, the Queen has been immune from prosecution for any crime. She is also exempt from giving evidence in court. In theory, this is because the Sovereign is incapable of doing or thinking wrong, which seems a little far-fetched considering Queen Elizabeth is just a human with normal vices – such as dogs – just like the rest of us.